Today marks the 17th anniversary of an unforgettable event. While returning from a trucking delivery to Florida along with my co-driver I accidentally left my billfold in Albany, GA. Upon tracking it down it dawned on me that I was in Jimmy Carter territory. Brenda, my bride, and admirer of Presidents. had previously mentioned that she would like to experience one of former President Carter's Bible classes. Fortunately, an employee at the truck stop had seen my wallet on the counter and put it in safe keeping. Well, I thought this is the time for Brenda's dream to come true. We decided to make a weekend of the event and attend class at the Maranatha congregation in Plains, GA. The event was delightful as we admired the orderly fashion, introduction, review of the Carters' recent benevolent accomplishments etc. We enjoyed the interactive class participation, subject matter and humor characteristic of our 39th President. To my surprise after relating a bit of my past, President Carter asked me to lead the congregation in prayer. He also invited the audience to join them for lunch at "Mama's Kitchen" after the service. He announced that they did not take individual pictures but that we could have a group picture as most visitors were groups bussed in for the events of the day. Then he added, "If you happen to not be with a group we will consider that you have no friends and make an exception" (my words from memory). The accompanying photo is from a memory compilation made after Brenda's death (November 2008). Thanks to President Carter for his work of love and benevolence. 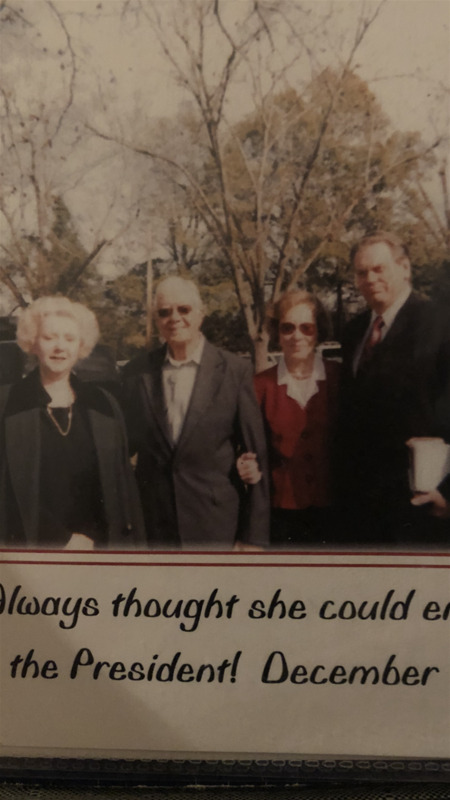 The caption reads, "Always thought she could entertain the President December 2001"
Today we are in sympathy over the death (November 30th) of our 41st President George Herbert Walker Bush. Sincere condolences for the family and all of us who loved him.